During the middle week of December, Haifa opens it’s door to one and all for the Festivals of Festivals, where cultural activities show no boundaries in embracing the festivals of Eid, Christmas and Chanuka in a celebration of co-existence. 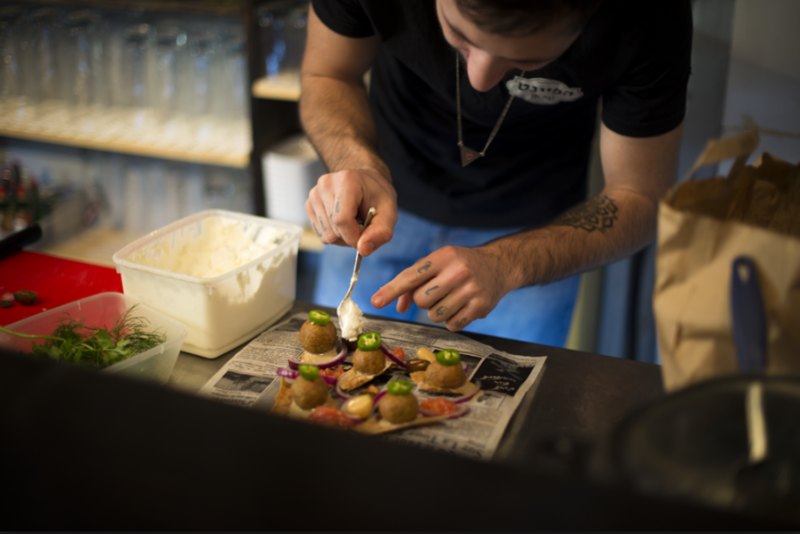 Amongst all the doughnuts and latkes on offer this year, the delights of Arab food is taking centre stage in the form of A-Sham, it’s meaning referring to the geographic area famous for the cuisine, the Levant area. Food on offer is being cooked by famous chefs including Atamna-Ismaeel, winner of the lasts year’s season of Master Chef, very popular now in Israel too. Dishes include Sfiha and Manakish, Levantine pizza-type dishes with dough bases as well as the more well known dishes of Kibbeh, Fattoush and Baklava. The Festival of Festivals is simply about bringing cultures together, and to my mind there is no better way than with the sharing of foods…. It’s that time of year; winter is upon us, darkness has fallen by late afternoon and we are looking to light the first candle in the menorah, for tonight we bring in the joyous festival of Chanukah. Chanukah is where we celebrate the miracle of light, when the Israelites found only enough oil to last for one night in the Holy Temple of Jerusalem, but through a miracle this last drop kept burning for eight nights. Therefore, every night for eight nights, we light a new candle in the menorah in celebration. Like most of the Jewish festivals, Chanukah is heavily associated with food and so to keep with tradition, we typically eat fried foods, such as sufganyiot otherwise known as doughnuts and potato latkes or pancakes, symbolising the miracle of the burning lamps. In Israel today, sufganyiot or deep fried doughnuts are a delicacy that are enjoyed by making yeasted dough, rolled into balls which ere then plumped up by inserting fruit jam into the middle and once deep fried, granulated sugar is sprinkled on top, giving rise to a sweet, sugary bun…..